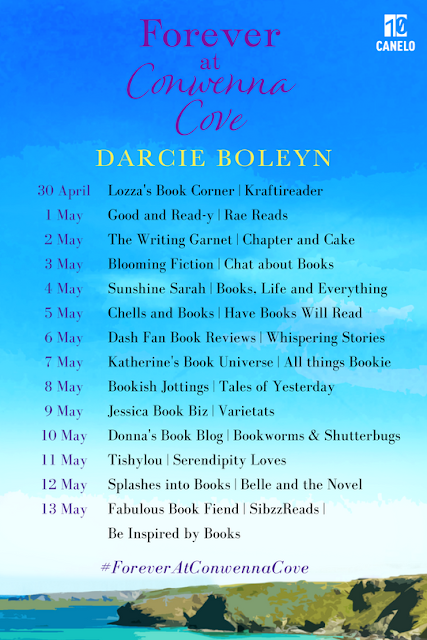 Today I am very excited to share an extract from the lastest in the Conwenna series by Darcie Boleyn. 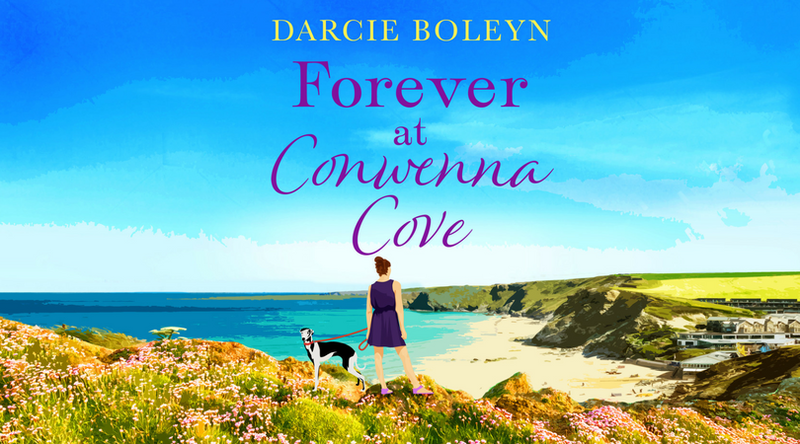 Forever at Conwenna Cove was released on April 23rd in the UK and you can order the book by clicking here. Zoe enjoyed an hour at Foxglove Farm, during which time she took one of the greyhounds on a walk around the nearby fields and then purchased her ice cream order for the diner. When she returned to work she felt completely ready for whatever the week would bring. She also knew that Neil had dropped a few hints about her considering adopting another hound, but she wasn’t ready yet. It wouldn’t be fair on the dog or on her. The morning at the diner was busy but not unbearably so, and it quietened down after one-thirty. When the door next opened, she was happy to see that it was Grace and Eve. She liked the two women, even though she didn’t know them very well; they were the type of women she had imagined she could be friends with when she was growing up. Zoe took their drinks over with the menus. As the chef, Alistair, made the food in the kitchen, Zoe pottered about behind the counter. She was so glad she’d employed him: when she’d first opened, she’d tried to do it all herself and soon discovered how difficult it was trying to manage the business and cook all the food. She now employed two chefs: Alistair worked through the week and Kierney covered the weekends and any extra opening hours in peak season. Both had proved to be talented and adept in the kitchen, which left Zoe able to cater to her customers and to enjoy owning the diner. She shivered. And that was why it was better not to let anyone into your heart and your mind. People couldn’t be trusted, however long you’d known them. At least keeping them at arm’s length meant that they couldn’t hurt you. When the food was ready, Zoe carried it to the table. Zoe slid her hands into her apron pocket. That’s wonderful, Zoe,’ Eve said, before biting into her veggie burger. ‘I wonder if your father will want to help out with the surfing event.’ The words escaped Zoe’s mouth before she even realized she’d thought them. ‘The one Nate’s arranging?’ Grace tucked her wavy red hair over her shoulder. ‘He’s leaving?’ Zoe tried to maintain an even tone to her voice, but she was suddenly and inexplicably quite disappointed. ‘Will he… uh… come back, or is it permanent?’ Zoe tried to keep her hands still in her apron pocket. Zoe bit the inside of her cheek to stop herself asking any more questions. Why should she care? Nate was everything she despised in men, with his devil-may-care attitude, sun-bronzed skin and easy smile. He reminded her far too much of things in her past that she’d prefer not to think about. If he was going away following Surf for Sighthounds, then that was a good thing and she couldn’t give a damn what he did. 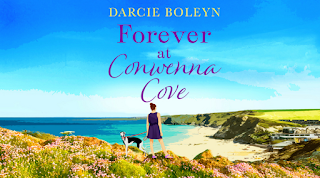 ‘When I arrived in Conwenna Cove, he made me feel so welcome. He was convinced that I’d stay, even though I only came to help Mum and Dad settle in. And when I first met Oli, Nate tried to reassure me that he was a good person, although initially he seemed a bit… standoffish.’ Grace’s eyes glazed over as she remembered. ‘Oli gave you the cold shoulder?’ Eve asked. 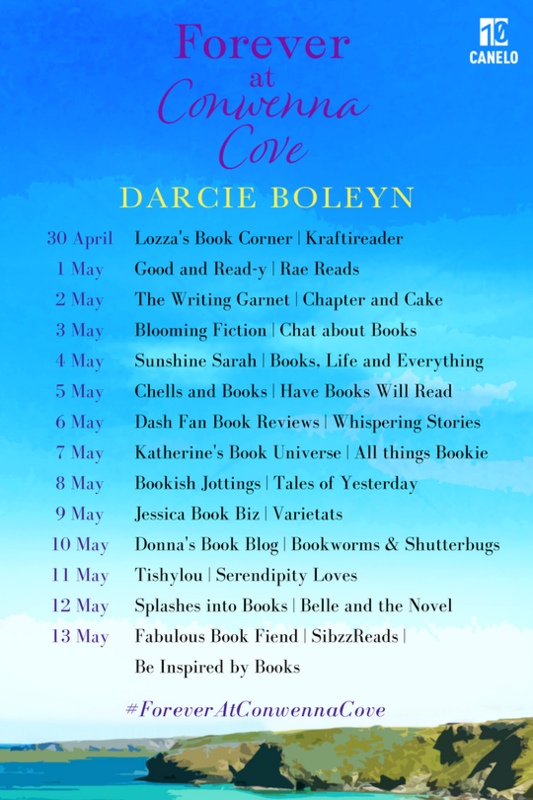 ‘And now you’re living happily ever after!’ Eve winked at Grace and they both giggled. Zoe smiled at their happiness. She knew enough about them to realize that life hadn’t been easy for either of them, and she’d never begrudge someone their happy moments. 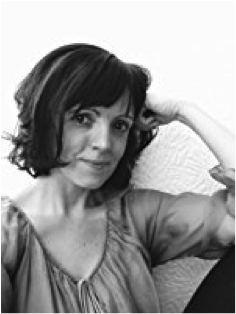 Zoe had once been happy too, in spite of some ups and downs along the way. At one point, years ago, she’d believed that she had it all. Then she’d had her accident and it had all seemed to fall apart. But that was life and there was no point crying over spilt milk, a broken surfboard or the fact that people often let down those they claimed to care about. She simply had to make the most of what she had now and ensure that she never ended up in a position where she could be hurt again: not by a surfboard, a best friend and definitely not by a man. Thank you for stopping by today Darcie!